We were blessed with the gift of a bag full of rhubarb from our naturopath, Dawn. She had more than she knew what to do with, and we were more than happy to take a bunch off her hands. :) It is one of Dave’s spring favorites after all! 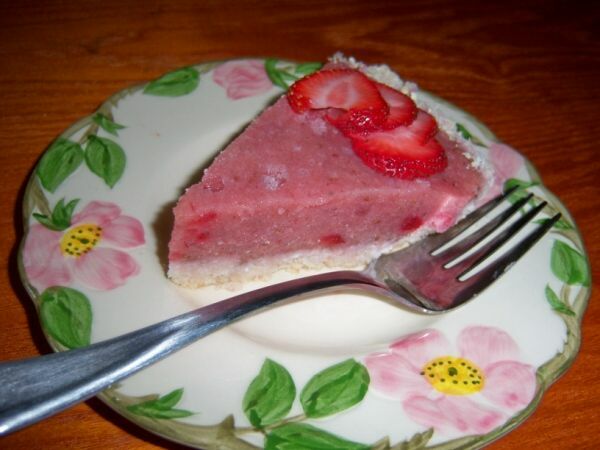 I have been messing around with raw desserts lately, and I hope you enjoy this Raw Strawberry Rhubarb Pie! 1.) THE NIGHT BEFORE — THE FILLING: In food processor, blend the rhubarb, lemon juice, stevia and 2 cups of strawberries until smooth, making sure to scrape down the sides if there are lumps. Pour into a bowl and stir in 1/2 cup diced strawberry chunks (this step is optional, but we like the extra strawberry chunks in each bite). Cover bowl and let sit in fridge for at least 12 hours to allow the flavors to blend (this is for the rhubarb, since it’s raw it needs time to break down). 2.) THE NEXT DAY — THE CRUST: In your food processor, add all crust ingredients and pulse until uniform consistency. It should be crumbly. Transfer your crust to a pie pan and press it firmly and evenly to line the pan. Set in fridge to firm up for about 15 minutes. 3.) To 2 Tablespoons of ice cold water, add the arrowroot powder and mix with fork until smooth. Take filling mixture out of fridge and stir in arrowroot mixture. With a spatula, pour the filling mixture onto the crust and spread it evenly throughout the pan. Cover and freeze for a half hour before slicing. It was verrrry good, Dave enjoyed it!